Heinz Meistermann’s achievement is nothing less than the rebirth of the classical adventure and travel novel. His hero, the 17 year-old son of a German wine merchant from Mainz, sees his future in the USA and emigrates on the spur of the moment to Boston. There, his immense talents are confronted with all types of activities and challenges – and it seems like he is just walking from one adventure to the next. But he proves himself up to all these challenges, even if he only escapes death by the skin of his teeth on some occasions. As he goes along, the knowledge of wine-growing and trade that he gathered in his early youth also proves extremely useful. More decisive for the success of his adventurous life however, is the young hero’s ability to take destiny into his own hands, and to not shy away from taking a risk, when it comes to standing his ground. Travels and Adventures of Simon Brown. A German abroad. Volume 2. Verlag 28 Eichen, Barnstorf 2017. 276 p. 19,00 €. Simon Balthasar Braun, born on the 27th of May 1812 in Mainz, Germany, is the third child of winery owner Balthasar Braun and his wife Josephine-Christine from London. Along with his siblings, Christoph and Josephine, he is tutored privately by the Belgian teacher Rudolf Vonecken, a man with very modern and open views for the time. Simon accompanies his father on a business trip to London when he is twelve. Over a number of weeks he becomes deeply engrossed in the world of wines and spirits at his grandfather Simon Hill’s shop. On one of his tours around London he meets an Indian girl called Marala. She is the same age as Simon and she shows him around her city. When he returns home to the banks of the Rhine, Simon gets to know the mysterious Dutchman Jan ter Bruggen, an experienced around-the-world sailor who has settled on a small vineyard nearby. Over the years, his friendship with the Dutchman awakens in Simon an unbridled curiosity for the big wide world. But in the end it is a letter from Marala that causes him to travel to London and to subsequently emigrate to America. During their reunion he falls in love with the young woman; alas though, she has been promised to another man by her parents. Marala has to obey, so Simon boards a sailing ship called the ‘Whitecap’ and leaves for Boston. During the crossing, he meets the banker Alastair Rowley and his young wife Lindsay, who invite him to stay at their house in America. From here on he calls himself Simon Brown. He completes his studies at Harvard and makes new friends. Unfortunately, he keeps having run-ins with Alexander Rickleby, a shipyard owner lacking in scruples. When Rickleby resolves to eliminate Simon, the young man has no choice but to take flight. 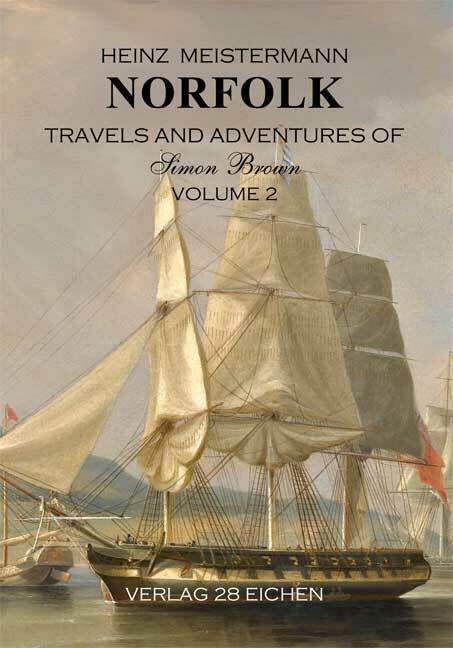 At the last moment he succeeds in getting aboard a merchant ship called the ‘Norfolk’ that is about to set sail for China.